I love it when someone goes “above and beyond” during the normal course of business and makes me sit back and say “wow”. During a recent trip to Maine, I had one of those moments that I’d like to share. On the cab ride from Portland to Freeport (the conference was held at the Harraseeket Inn), Dan from AB Cab, and I had a very enjoyable conversation and we chatted about the area. This was my first time to Maine (and unfortunately was not going to be able to spend much time there), but he talked about all the great things to do if I ever came back. Spending money at the L.L. Bean store would be top on my list (they’re open 24 hours, you know) as well as being able to enjoy some of the local seafood. Well, speaking of seafood… when we arrived at the Inn, Dan wanted to make sure that I got my “Lobster Stamp” for my boarding pass on the return flight back home. 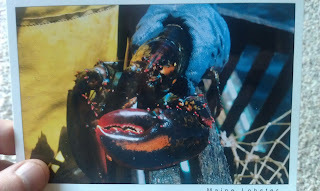 Of course, I took the bait and asked “what’s a Lobster Stamp?” Dan went on to tell me that due to government regulation and environmental concerns, the local lobstermen were required to replace all their rope with special rope that sinks so as to not entangle other marine live. They also had to update all of their lobster traps and several other “requirements” that had made it very expensive to be in the lobster business. Of course, I knew he was joking and played along, but the story was a good one and made the cab ride from the airport that much more enjoyable. Plus, I now had an idea for my “opening remarks” the following morning during my session. In fact, when I checked in at the Inn, I told the story to the front desk and they all seemed to get a kick out of it (and thought it was a good idea, too). The reason I was in Maine was to present for the Maine Bankers Association at their 2011 Emerging Leaders Conference. As is typically the case with my speaking topics, this session was focused on the ways to leverage “social strategies” to connect with customers and promote the bank. I started off telling the story of the Lobster Stamp to lighten the mood and the bankers all seemed to find humor in the good-natured ribbing of this Michigander. I then started my presentation and shared the following video from Erik Qualman, the author of the book Socialnomics. A key statistic that one of the bankers (kudos Katie!) picked up on after the video was done stated that 90% of people trust the opinions of their peers, while only 14% trust advertisements. A powerful statistic, considering if you look at the makeup of a typical operating budget, most banks (and I suspect businesses in general) spend a lot more of their time and money on advertising, yet it’ s becoming less relevant in today’s social world. Additionally, just a year ago the earlier version of this video had the numbers at 78%/14%. As you can see, the power of the “crowd” is gaining importance, as we are increasingly more concerned about what others think about a business or service than what their advertisements say. This further demonstrates the power of “word of mouth” and why it’s important to get yourself “outside of the box” and do things that make people stand up and take notice. Create a WOW moment that people will want to talk about and play off the 90%. This leads me to the point of my entire story… I went to checkout after my session was done and it started off as any usual checkout goes. “Room 304 please,” I said. “Thank you Mr. Cook, we hope you enjoyed your stay,” was the response – typical (and yes, I did, it was very nice). However, one of the other ladies chimed in and said, “Oh, you’re Mr. Cook, we have something for you…” and proceeded to hand me a postcard with – you guessed it – a picture of a Maine Lobster on the front! On the back was a hand-written note that said: “Mr. Cook – This should fill the taxi qualifications for a lobster stamp. ☺ Hope you had a nice visit. Cheerfully, Kathy & front desk staff, Harraseeket Inn.” Not only was I literally “blown away” by this gesture, but I made a point of going back into the dining room where the rest of the bankers were finishing their lunch to share the fact that I indeed got a “Lobster Stamp” for my return trip home! I made a point of ensuring that my contact from the Maine Bankers Association also was aware of this “above-and-beyond” gesture so that she could mention it to management. Kathy did something that all of us can learn a lesson from. She listened to my story when I checked in the prior evening and saw an opportunity to step outside of her box and do something that would cause me to say “wow”. As a result, I’m spending time telling you about my experience in this post and helping to fuel the 90% (what others say about your business). I can tell you that when (not if) I come back for a visit in the future, there’s no way I’m staying any place other than the Harraseeket Inn. I’m sure there are a lot of quaint and very nice places to stay at in the area. But, thanks to Kathy (and her front desk team), they created a loyal customer that’s willing to tell others about his experience. I just hope I get to come back again soon. I challenge you to pay attention to what goes on during the general course of your business day. While you may think it’s the “same ‘ole, same ‘ole”, you might be surprised. Are your customers unknowingly leaving hints for you to pick up on to create a “wow” experience for them, like Kathy did for me? I challenge you to get out of your normal routine and force yourself to be more aware of what’s going on. You might be surprised. For the cost of a postcard, you too may have the ability to make someone’s day and tell their friends. Embrace the 90%... (and don't forget your Lobster Stamp next time you're in Maine)! Thanks for the compliment and glad you liked the post. I wonder if you go to Memphis if they require a BBQ stamp?? ?